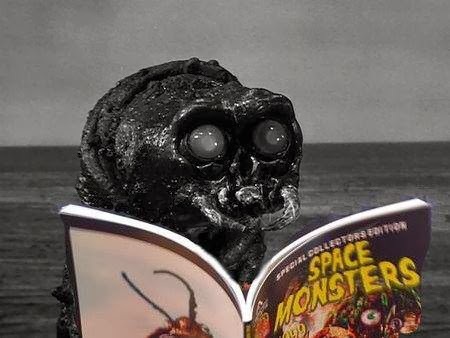 Space Monsters is a new mag for fans of classic film and TV sci-fi. Thanks to Richard Gladman, who supplied a review copy, TMW takes a peek inside its second issue. Space Monsters is a new UK publication from the folks over at the Classic Horror Campaign, focusing on sci-fi, horror and fantasy on both the big and small screen. It's available in both print and digital form and issue two is currently on sale. This issue is a special "Space Vampires" issue. That's right, bloodsuckers aren't just confined to planet Earth, as the various features here illustrate. Chris O'Loughlin provides a comprehensive look at the making of Lifeforce (the new blu-ray of which was recently reviewed by our own Jason Abbey), Tobe Hooper's troubled 1985 sci-fi horror that has been undergoing much revisionism of late. The UK's premium Scream Queen, Emily Booth, contributes a well written piece on the fifties classic It! The Terror From Beyond Space, proving she's more than just a pretty face and a strong set of, er...lungs. None other than TV's Buck Rogers featured an episode titled Space Vampire and Ernie Magnotta gives it a trivia-laden review. He also takes a look at Ted V Mikel's cult classic The Astro Zombies. One of my faves from the fifties, The Thing From Another World, is analysed by Eric McNaughton and the fantastic collection of lobby cards that illustrate this piece alone are worth picking up a copy to check out. Rounding out the Space Vampire theme are reviews of movies like Not of this Earth, Planet of the Vampires and Queen of Blood, and a feature on the comic book character Vampirella. Away from the issue's central theme is the first part of an Ultraman episode guide and an interview with film-maker Christopher R Mihm, creator of fifties style B-Movie homages like The Monster of Phantom Lake and Cave Women on Mars. The magazine is nicely adorned with artwork from Woody Welch and Billy Chainsaw. Space Monsters is the closest the UK has to a Famous Monsters of Filmland type publication and will surely be a welcome addition to the reading lists of cult movie fans. Visit the Space Monsters website for more info and to purchase your own copy.